KONG Rewards Ball is a fun, fillable toy ball for dogs. You can fill this ball with tasty dog food or snacks. When your pet plays with this ball, it will roll and bounce in every direction! Rolling and playing with the ball for a reward keeps your dog active. The Rewards Ball from KONG is a fillable toy ball for dogs. You can fill this ball with dry food or snacks and it will roll or bounce in all directions while your pet plays with it. This allows you to offer your dog snacks and dry food. By actively playing with the ball, the rewards will fall out of the ball evenly. 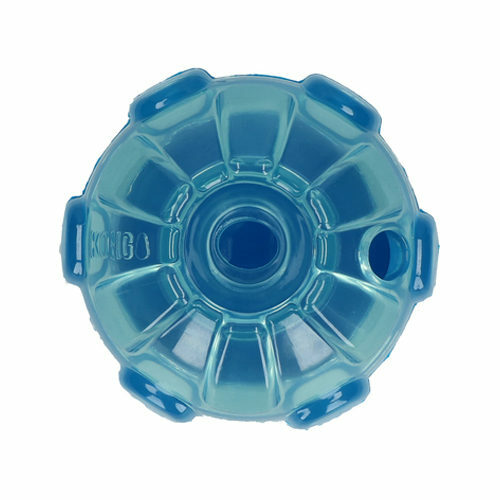 This makes the Rewards Ball great for use with dogs that gobble their food. This fun fillable ball also prevents your pet from getting bored and it contributes to hours of entertainment! Prevents boredom and contributes to hours of entertainment! Have you used KONG Rewards Ball before? Let us know what you think about this product.